In addressing the impact of mass incarceration, there is an increasing need to center the voices of those directly impacted—not only as experts, but as integrated contributors. But for writers in prison, access to participation in the literary community is limited by not only stigma and physical restriction, but financial barriers, lack of technology, and censorship. For those who manage to publish against the odds, publicity efforts require creative strategy when book tours are impossible, interviews channel through authority review, advances are siphoned by the state, and context automatically forces categorization by the author's relationship with incarceration or crime, regardless of the work’s content. Hosted by the PEN America Prison & Justice Writing Program, this series of conversations confronts the challenges and ethics of publishing incarcerated writers, and re-imagining the boundaries of what is possible. & Daniel Gross, Prisons Editor at the Asian American Writers' Workshop. 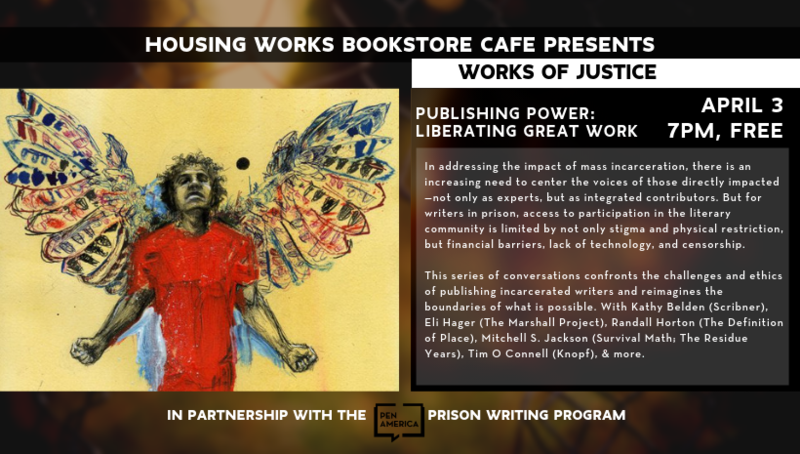 Presented by Housing Works Bookstore Cafe and the PEN America Prison Writing Program, "Works of Justice" is a series exploring the relationship between writing and incarceration, amplifying work by writers in prison, and presenting challenging conversations about criminal justice in the USA. Kathryn Belden is Vice President and Executive Editor at Scribner. Writers she has worked with include Roz Chast, Mitchell S. Jackson, Andrew Krivak, Gordon Lish, Lisa See, Jesmyn Ward, and John Edgar Wideman, among many others. Previously she worked at Bloomsbury, Four Walls Eight Windows, and Harmony Books/Crown Publishers. She is the editor of The Graybar Hotel by Curtis Jackson. Eli Hager is a staff writer at The Marshall Project covering issues including juvenile justice, fines and fees, and prosecutors and public defenders. His work has appeared in The New York Times, The Washington Post, The Guardian and elsewhere. In 2017, Eli was named a Livingston Award finalist for his investigation into private prisoner transportation. He is a graduate of the University of Michigan and Columbia University. Randall Horton is the author of The Definition of Place (2006) and Lingua Franca of Ninth Street(2009), both from Main Street Rag. His poetry prizes include the Gwendolyn Brooks Poetry Award and the Bea González Prize for Poetry. He has an MFA from Chicago State University and a PhD from SUNY Albany. Horton is a Cave Canem Fellow, a member of the Affrilachian Poets, and assistant professor of English at the University of New Haven. He also serves as senior editor for Willow Books and editor-in-chief for Tidal Basin Review. Mitchell S. Jackson is the author of Survival Math. His debut novel The Residue Years was praised by publications, including The New York Times, The Paris Review, and The Times (London). The novel won the Ernest Gaines Prize for Literary Excellence, and it was also a finalist for the Center for Fiction’s Flaherty-Dunnan First Novel Prize, the PEN/Hemingway Award for First Fiction, and the Hurston/Wright Legacy Award. Jackson’s honors include fellowships from the Whiting Foundation, TED, the Lannan Foundation, the Bread Loaf Writers’ Conference, and the Center for Fiction. His writing has appeared in The New York Times Book Review, Salon, and Tin House, among other publications. He serves on the faculty at New York University and Columbia University. Tim O’Connell is an senior editor at Vintage Anchor, A. A. Knopf, and Pantheon Books. Writers he has worked with include Jamie Gordon, Nathan Hill, Sergio De la Pava, Charles Yu, Kristen Radtke, Pajtim Statovci, Karin Tidbeck, among others. He is the editor of Cherry, by Nico Walker.